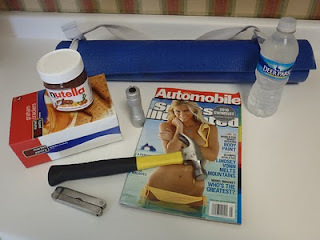 My intial plan for this blog was to post some archives to give you a taste of what I'm capable of delivering. However, sometimes life just drops a gem in your lap that you just can't ignore. And Puff gave me such a gem this past weekend. He decided it was the right time to step up and do something manly. To do something earthy and gritty and respectable. It was time for him to go camping. Alone. In the vast, wild wilderness that encompasses our fenced in backyard. It all came about Friday night when we were coming home from a pizza & beer excursion with some friends. One of our neighbors had a large yellow & white tent set up in their backyard. Ya know, the ones that are used for parties or weddings or family reunions... something fairly socially acceptable. Well, seeing that tent, a lightbulb clicked in Puff's head, "A ha! I have a tent!" And do you know why two people who are reasonably urban and like indoor plumbing even OWN a tent? Because last spring, Puff hit the 5 year mark with his company. Along with such an occasion comes a catalog full of items one can choose a gift from. And for some reason, unbeknownst to me, the things he thought we needed most were a tent and a sleeping bag. You can trust me when I say that had I known there was a catalog full of gizmos and gadgets that we might actually use, there's no way I would have happily accpeted that box from the UPS man that day. 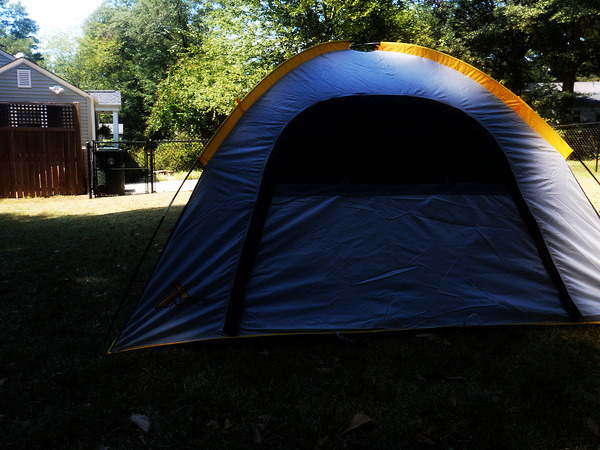 So, Saturday afternoon, after helping a friend move some furniture and hitting up the pool for a little while, we gathered up everything a good outdoorsman would need and set up the two-person tent in our yard, right under the giant old oak tree. As we were assembling it, I was very careful to make sure that the opening faced toward our house, to lessen the "creep-factor" for Suzy Neighbor. And yes, Saturday night, after a nice dinner out with friends and some beer and strudel from an Oktoberfest, I snuggled into our nice, big, new bed, under our down comforter and he ventured out into the darkness with his little flashlight. And he survived. He made it safely back to the confines of The Bungalow a little sore and a little wet. That 40% chance turned to a 100% chance in the early morning hours. However, the best reaction of it all was when Kimhead showed up at our house and saw the blue & yellow tent stoically sitting at the back of our property. After a doubled-over fit of giggles, she had a very serious question about the whole expedition. It wasn't a question about bugs or rain or supplies or even wild moose. Nope. Her question? "Well, aren't you scared of the gangs?" I am happy to report there were no sightings of any anti-camping gangs in our neighborhood last night. We dodged the bullet.